We have just received an anonymous matching grant – up to $1,000 – if we can raise $1,000 between now and Thanksgiving for the Yarmouth Community Food Pantry! Your donation will be instantly doubled when you make a donation to YCAN with the “Food Pantry grant” written in the memo line. To donate, please mail checks payable to: YCAN, PO Box 553, Yarmouth, ME 04096 – or drop it off at Yarmouth Community Services behind Town Hall at 200 Main Street (Monday-Friday 8:30am-4:30pm). 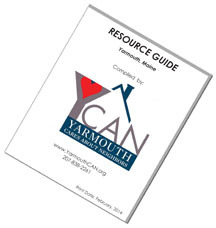 YCAN is a 501(c)(3) non-profit. Contributions are tax-deductible to the extent allowed by law. A celebration was held at the First Parish Church on February 2nd to thank Sue Rowe for her many years of service to what is now the Yarmouth Community Food Pantry. Sue will soon step down from her managing role, and a team of volunteers is in the process of being assembled to take on the many roles she has so ably filled. Over $1,500 worth of food was donated to the Food Pantry in her honor, and the following plaque will be hung on the wall of the Yarmouth Community Food Pantry. Posted on February 6, 2017 Author ycan11Categories YCANTags Food PantryLeave a comment on Thank You Sue Rowe!